Quarterback Aaron Rodgers of the Green Bay Packers walks off the field during last season’s NFC championship game against the Seattle Seahawks at CenturyLink Field in Seattle. In preparation for the 2015 NFL season, FiveThirtyEight is running a series of eight division previews, each highlighting the numbers that may influence a team’s performance (including projections and rankings based on ESPN’s preseason Football Power Index). To start things off, we head to the NFC North, a division that’s still the Packers’ to lose — but one that could get interesting if the Lions’ defense stays elite, the youthful Vikings improve or the Bears repair their once-proud D.
An anomaly within the NFL, Green Bay is known as the only small town with a pro football team. And given the provincial nature of small towns, perhaps it’s fitting that the Packers of recent vintage boast a roster with few interlopers from other teams. Last year, only two of the Packers’ regular starters — outside linebacker Julius Peppers and defensive lineman Letroy Guion — had begun their NFL careers outside of Green Bay. Fullback John Kuhn, who began his career with the Steelers, is the only other player who started a game for last year’s Packers after playing for a franchise other than Green Bay. Using the Approximate Value (AV) metric developed by Pro-Football-Reference.com, we can try to quantify exactly how “homegrown” a team is relative to the rest of the NFL. For example, the Packers produced 249 points of AV last year, only 18 of which came from players who did not begin their career with the club. This isn’t exactly a new development for the Packers. In every season since 2008, when they traded away Brett Favre and installed Aaron Rodgers as starting quarterback, at least 85 percent of Green Bay’s team AV has come from players who began their career with the Packers. Not much will change in 2015, either, as Peppers, Guion and Kuhn once again figure to be the only notable Packers who started elsewhere. It may not be a sustainable strategy for every team, but the Packers have used it to build the most homemade — and, arguably, best — roster in football. In 2014, the Lions ranked among the NFL’s top five defenses according to DVOA,3 Expected Points and SRS — a stunning break with the franchise’s dismal tradition. 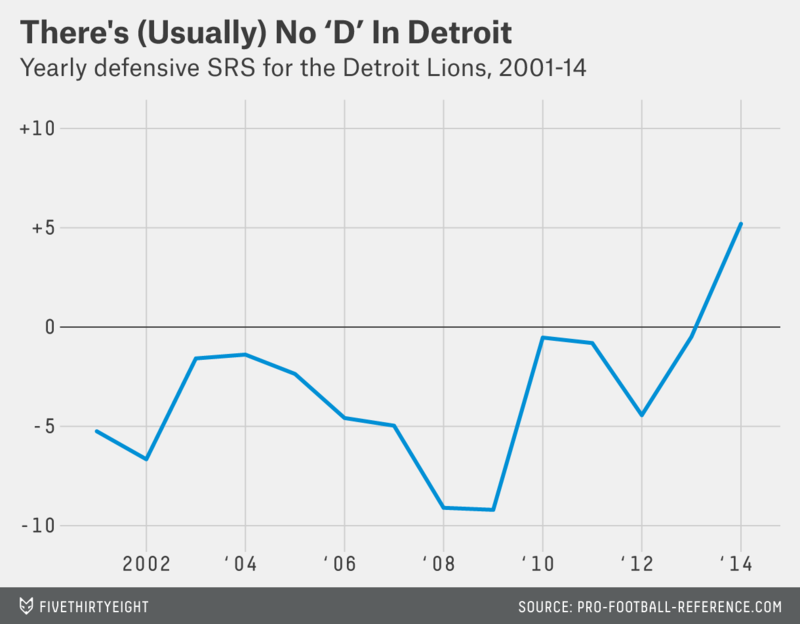 But the pressing question for Detroit now is whether its defensive makeover can persist. To help answer that, I looked at all teams since 1970 with defensive SRS ratings roughly similar to the Lions’ +5.2 mark last year.4 Then I broke those teams into five groups based on their aggregate defensive SRS ratings in the two seasons before their strong defensive year. (For Detroit, these seasons would be 2012 and 2013, when the team posted a putrid -2.5 defensive SRS.) Historically, how did teams with similarly meteoric defensive improvements fare the next season? Not well, as it turns out. The worst group of teams in defensive SRS over the previous two years — i.e., the cohort most similar to the 2012-15 Lions — regressed significantly the next year. In Detroit’s case, there are additional reasons to expect a defensive regression, between an aging secondary and a handful of important personnel losses headlined by the departure of DT Ndamukong Suh, who signed with Miami as a free agent. After more than a decade of ugly defenses, Detroit fans finally got to watch a first-rate defense last year. But the Lions’ chances of repeating that feat likely left with Suh. If you want optimistic predictions for the 2015 Minnesota Vikings, don’t look to traditional sources. Summer power rankings from both ESPN and NFL.com peg Minnesota for the bottom half of the league, as does the most recent set of Las Vegas win totals. It’s not hard to see why, either: Over the past two seasons, Minnesota has endured the 10th-worst record in football. But others think the Vikings can be a sleeper playoff pick — if not more. For instance, after taking stock of Minnesota’s “wave of young talent and a promising head coach-quarterback combination entering its second season,” the statistical website Football Outsiders projected the team to rank sixth in the league in DVOA, a metric that measures team performance on a play-by-play basis. Here’s another quantitative reason to think the Vikings could be on the verge of a breakout: Minnesota had the NFL’s fourth-youngest team last year. Between 22-year-old quarterback Teddy Bridgewater and an emerging defense whose best performers5 were taken in the first rounds of the past few drafts, Minnesota might be poised for a big improvement this season as its players mature. This is particularly relevant to Minnesota, since the youngest 20 percent of the teams in the study averaged 6.9 wins (the Vikes won 7 a year ago) and had an average age of 26.2 (Minnesota’s was 26.3). The next year, those teams won an average of just 7.7 games — slight progress, but nothing as dramatic as Vikings fans are hoping for. The Chicago Bears are a franchise defined by defense. 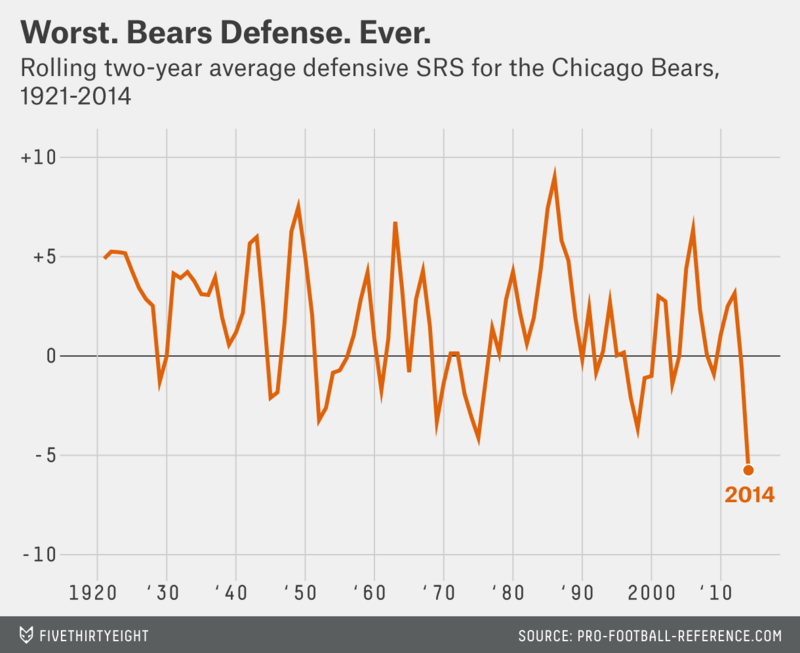 In the two seasons since 2012, though, the Bears have fielded arguably the worst two defenses in franchise history. Over that stretch, they ranked 31st out of 32 teams in yards allowed and dead last in points allowed, reaching historic levels of futility against both the run and the pass. In 2013, the Bears allowed 2,583 rushing yards — the most in team history10; 5.4 yards per rush — the most by any Bears defense since 1951; and 22 rushing touchdowns — the second-most in franchise history.11 Then, last season, the pass defense fell apart, as Chicago opponents set new franchise highs for completion percentage (66.8%), passing yards (4,230) and passing touchdowns (34). This season marks the 30th anniversary of the fabled 1985 Bears, winners of the franchise’s only Super Bowl title. That year, Chicago’s defense allowed 65 fewer points than any other team in football, still the largest gap between the top two teams in points allowed in any season since 1970. Whenever a “best defense of all time” ranking is constructed, whether subjective or objective, it’s a good bet that the ‘85 Bears will show up at or near the top. Unfortunately, Chicago’s 2015 defense bears little resemblance to that team, or even the last good Bears defense. In 2012, Chicago ranked third in points allowed, and the only defensive starter remaining from that team — cornerback Tim Jennings — was just released. And if the Bears’ defensive ranking of 31st in ESPN’s preseason Football Power Index is any indication, this will be another trying year for a franchise that badly needs a return to defensive glory. Wide receivers Jordy Nelson in 2008 and Randall Cobb in 2011, and running back Eddie Lacy in 2013. Three of the Packers’ O-line starters were drafted in that round: left tackle David Bakhtiari and guards Josh Sitton and T.J. Lang. This stands for defense-adjusted value over average. Specifically, ratings between +3.2 and +7.2. Namely Sharrif Floyd, Harrison Smith, Anthony Barr and Xavier Rhodes. The NFL adopted a 16-game regular season in 1978. This gives us 328 team-seasons, excluding 1981, 1986 and 2014 because the data for the following season was either disrupted by labor strife or does not exist yet. Specifically, Approximate Value-Adjusted Age, as described here. Among the 28 teams in existence during the majority of that period. Granting that, on a per-game basis, the 1973 rush defense was even worse. Trailing only the 1975 team.